Finnish metal band Lordi, who dress in monster masks and outlandish fantasy costumes, have taken the Eurovision Song Contest by storm. They would not look out of place in a Lord of the Rings film, their lead singer describes himself as "the hulk of hell" and they sing about "the arockalypse" and "the day of rockoning". 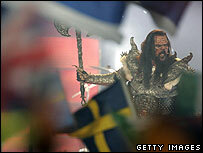 And now Lordi have joined the likes of Abba, Bucks Fizz, Dana and Celine Dion on the elite list of Eurovision winners. This hard rock band were already successful in their home country, but have now become a phenomenon in Europe. That is partly thanks to their gloriously over-the-top theatrics and stadium rock anthems. But they may also have captured the imaginations of those who wanted to register a protest vote against Eurovision's normal diet of plastic pop. Their fearsome appearance and religious references led to some protests in Finland and host country Greece before this year's contest. Father Mitro Repo, an Orthodox Christian clergyman in Helsinki, described the band's use of the name "Lordi" as "sacrilege". And a group of Greek protesters known as the Hellenes called on the Finnish government to intervene. "We ask the Finnish Commission of the Eurovision Song Contest to cancel the procedure and choose another song," they said. 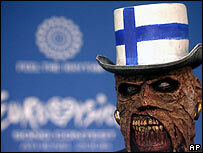 "This evil and satanic Finnish band is not welcome in Greece." But Lordi's lead singer, also known as Lordi, brushed aside the complaints, insisting: "We have nothing to do with satan worshipping or anything like that - this is entertainment." Real name Tomi Putaansuu, the singer hails from Arctic Lapland and says his band's masked personas are just characters. "The guys behind the masks are not interesting - they walk the dogs," he said. But the characters "live on stage and they live in a fantasy world", he said. "This element of mystery is one of the cornerstones of Lordi." Now 32, Putaansuu started drawing monster designs on his face with his mother's make-up at the age of seven and was making horror films with his parents' video camera three years later. He graduated from film school and earned a living drawing storyboards, forming Lordi in 1992. They spent the first 10 years trying to get a record deal but their debut album Get Heavy went platinum in their home country in 2002 and their "greatest hits" compilation has been released in 20 countries. They thought the Finnish Eurovision board had made a mistake when they approached the band to take part in the contest while they were recording their third album. 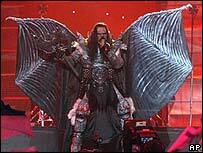 But Lordi agreed and won 42% of the vote in the national competition to pick Finland's entry. There were fears that they could flop and prove a laughing stock - but they have now become the country's first Eurovision winners. And now with a newfound global fan base, they could use their Eurovision success as a springboard to the next level of rock stardom.